While I was shooting photos at a kitchen in Sunset Park, a lady from the kitchen next door asked all of us if we wanted tortas for dinner. You know I love tortas and couldn’t resist. I got a pork torta. After about 20mins later, the lady came back with a big bag of tortas. I asked her where she went and she told me Puebla Mini Market on 5th Ave and 39th St. I may have to start a Dinevore list of places to get tortas. This torta ($7) was delicious. 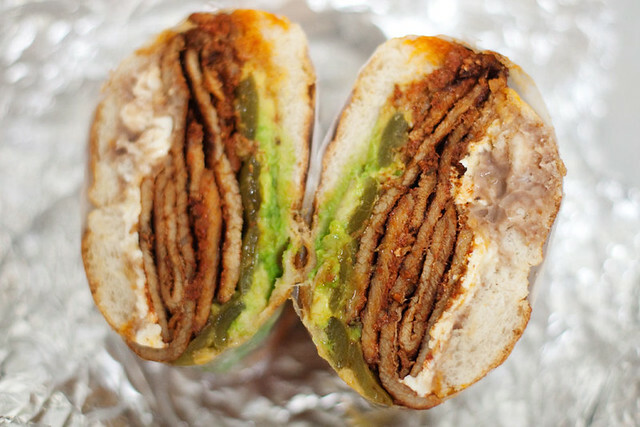 Layers and layers of pork with avocado, jalapenos, and oaxaca. The bread was slightly toasted and had a nice outside crunchy texture. It got a little messy towards the end but it didn’t really matter when it was so good.